SSL.com is a company that offers SSL certificate products. It is headquartered in Houston, Texas, USA. The SSL.com SSL certificate reviews listed below will help you determine whether SSL.com is a good company to buy SSL certificates from. The reviews have been verified to be from real SSL.com customers. 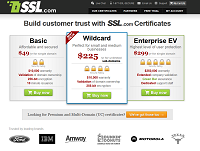 If you want to compare SSL.com SSL certificates with certificates from other SSL providers, use our SSL Wizard. If you have ever purchased or received a certificate from SSL.com, please post a SSL.com SSL review to let others know what to expect. I have an issue with installing SSL on my site and then i contact support, they are really awesome, showed me all the step by step instruction. I really like the way of their support so much. I switch to from GoDyddy and i'm shocked by simplicity and how responsive support is. Great! Charls was awesome and helped me right away! Was trying to fix an issue from 7PM to 3AM and Charls had me through it in 15 mins. Cheap and Easy to use! Recommended! was waiting for validation to happen, awesome and quick resolution. I had a little trouble in understanding the parameters of the SSL certificate and install. However, not to fear. Tom or Michael were always instantly available to answer questions and help in the process. They provided immediate information and streamlined answers to speed up the process and got us secured in no time. Charls helped all the way.. I am not in to making new website so I gave him a hard time. The team was supportive and had a lot of patience. Best support you could ask for! Create Customer Service. I had a question about the processing. On the chat, the support does a great job. Worked with "TomZ." via chat both before and after the sale and wow, what a great experience. Extremely patient, very knowledgeable and just plain outstanding customer service. I couldn't recommend ssl.com any more, it's great. I've completed a few certificates from SSL.com and I've always received hours of very useful chat help from them. TomZ. is excellent. SSL.com is the way to go! I needed some help with re-issuing. Answers were really fast and helpful. Really good customer experience! Purchase of SSL certificate through SSL.com was easy and simple and the online chat help was great. Cleared all our queries in immediately. SSL.com was recommended to me by a friend who works in the web development and marketing field. She said she has had the best experience with SSL.com when it comes to SSL certs. From what I observed, SSL.com is indeed very good, and the support is awesome. I would have been lost without them, but Charls was very helpful in setting things up for me. Keep up the good work, and now that you've made this process easy for me I will renew my certificate for a longer duration next time. Very fast, easy and the cheapest in this period!